Pachydermata (meaning 'thick skin') is an obsolete order of mammals at one time recognized by many systematists. Because it is polyphyletic, the order is no longer in use. That bit's kinda from wikipedia. 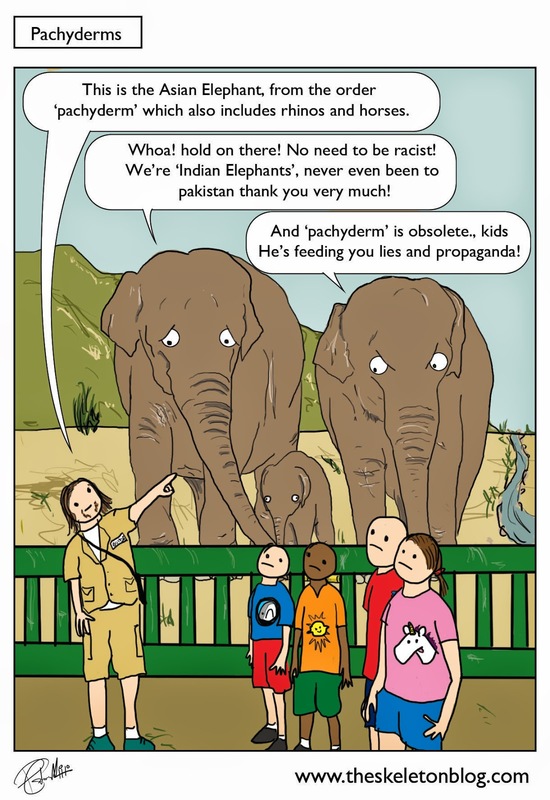 Pachyderm was used to describe horses, rhino, elephants, hippos etc. It seems weird to me to group horses in with all that but they did. For animals with a thick skin, elephants seem to take offence quite easily. I was at the zoo one time with my sister when she was really small. We made her wave at the elephants. One elephant swung it's trunk back and forth, we thought it was waving back, it was really just scooping fist sized rock up from the ground to throw at my sisters head. It missed. If anyone ever tells you to stop throwing rocks at elephants, you can tell them I said it's ok. They have thick skins. Unlike human toddlers. I recommend that you now watch this song about elephants by Evelyn Evelyn., on the youtubes.